The world stopped growing about 1988... and has only grown older since. Global births, per five year periods, according to the UN. Births and UN medium and low variant estimates through 2040...plus my best estimate of the most likely births. Despite the significantly larger (older) total population, births continue to languish and appear set to decline. 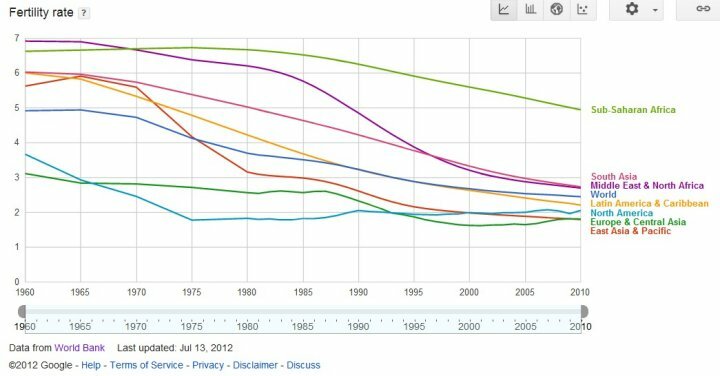 Since 2000, total births are declining everywhere except Africa. Assuming the UN medium variant...chart below shows births by Africa, S. Asia (India, Pakistan, Afghanistan, Bangladesh, Bhutan, Nepal, Iran, Sri Lanka) and the world minus Africa / S. Asia..
Or, looking at births by GNI (gross national income) per capita. Only the poorest nations are having more children, while all other nations (by income) are having significantly fewer (high income and upper middle) or stalling (lower middle income nations). The next charts below show the child bearing populations, from high, upper middle, lower middle, and low income countries (based on 2016 GNI per capita, detailed by the World Bank HERE). For the high income countries, peak annual growth in the child bearing population took place as of 1963, but the total child bearing population didn't peak until 2009. The population capable of child birth will continue falling through at least 2030 and likely far longer. The upper middle income countries peak annual growth took place as of 1985 and the total child bearing population also turned negative in 2009...and again will continue declining indefinitely. Lower middle income countries peak annual child bearing population growth took place in 2000 and annual and total growth continues to decelerate. Low income countries annual child bearing population growth is still rising and not likely to peak until around 2040, while the total child bearing population will continue rising until perhaps 2060. Finally, the best proxy for economic activity is energy consumption. The chart below shows actual and EIA estimate energy consumption through 2040. Clearly, the population growth in S. Asia (lower middle income) and particularly in Africa (low income nations) has not and is not anticipated to result in significant energy consumption or economic activity. What that looks like as a %. Somebody should write about this stuff. Oh, that's gonna work out well. another thing Leftist university professors can stop scaring children with. A real worry, will robots get cheap enough to be used in nursing homes to carry our bedpans? Meanwhile, since 1980 there have been an estimated 1.8 BILLION Abortions worldwide. Satan can’t beat God, so he’ll try to convince His creation that it is convenient to eliminate itself. Remember when AIDS was going to devastate Africa so we sent billions in dollars, drugs, and aid to stop it? Did the money, drugs, and aid work or was it mostly hype to aid for Africa? During the Cold War the average Russian woman had had 6 abortions by the age of 35. I’ve grown older since 1988. Yet Muslims are having no difficulties increasing the number of their offspring. This is something that the charts seem to ignore. This is extremely interesting to me since I have recently (in the last year?) read that global population has hit a plateau and will not continue to rise. That did not make sense to me, at the time. But now seeing these explanations it is rather convincing. At least I am more inclined to agree. So unless life spans increase very significantly we may have hit “peak people”. And of the babies being born here guess which demographics dominate? read that global population has hit a plateau and will not continue to rise. Not so. It's like the difference between the federal deficit and the federal debt - birth rate is no longer increasing, but population will continue to grow until the death rate catches up to the birth rate. The visual I have for the earth in about 100 years is not pleasant. Correct data incorrectly interpreted - see post #13. The world stopped growing about 1988... Tell that to Paul Ehrlich. I'm starting to think that teaching will be cut back. To teach a child is to say they don't know something. To say they don't know something is to call them stupid and it is also probably racist in most cases. I only think that because it has become a PC issue to criticize a child if he/she used really bad language, bad English or dresses inappropriately. It is getting to be that anything goes behaviorally. So why not academically? ...mostly hype to aid for Africa? Mostly hype to aid for multinational pharmaceutical corporations. Believe it or not, Muslim nations' birthrates has gone down, too. Figure 1 shows significant falls in TFR in all regions of the world, although the poorest part of the world (Sub Saharan Africa) still maintains a high but declining level of fertility.